« How about earthquakes and wildland fires? Now that is heavy metal! 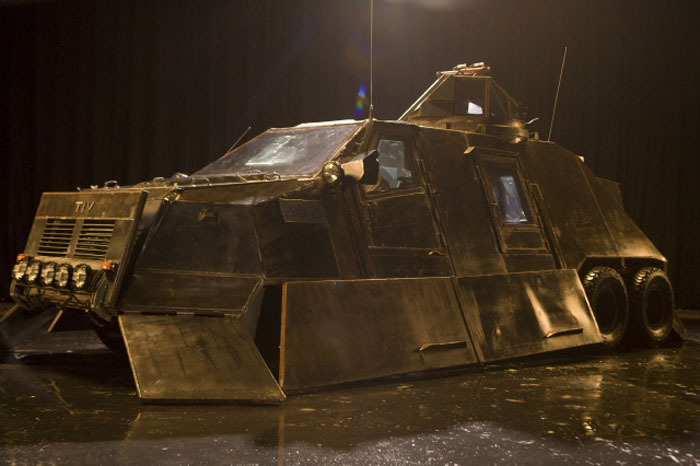 The TIV 2 is a machine designed specifically for driving into a tornado. Image courtesy Discovery Channel. The 2008 tornado season was historical for its ferocity. Record breaking numbers of twisters struck Tornado Alley with a frequency not seen in years. In June, north central and western Kansas were ground zero for tornado outbreaks that went on for days. With the DOW and all the chase vehicles up and running again, the team finds themselves hunting in the same territory as the rival TVN crew. Tornadoes are forming all over western Kansas on what looks like the biggest day of the season. This week’s sneak peak – A funnel cloud begins to form in the skies over Quinter, Kansas as the the Storm Chasers scramble to approach it. This entry was posted on Saturday, November 22nd, 2008 at 2:07am MDT and is filed under Climatology, National Weather, Severe Weather. You can follow any responses to this entry through the RSS 2.0 feed. You can skip to the end and leave a response. Pinging is currently not allowed.